Please give us some information about your vehicle below. In order to correctly make your cut and sewn carpet, we need the following information. If you select "Other", please supply the correct information in the detail line. 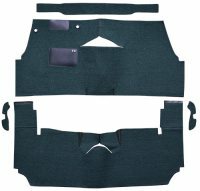 Stock Interiors is proud to offer the highest quality replacement Buick Skylark carpet and floor mats available to the industry. Our Cut and Sewn carpets are made from OE Quality materials and are made to look and fit like the original Buick Skylark carpet. Prior to 1960 most auto carpets	were cut and sewn, so we have reproduced many of our carpets in this original cut and sewn method. Cut and Sewn Carpets will come with Jute Padding for all cars. This carpet set will fit the Buick Skylark for the following years: 1954.